Nathaniel Richardson, 23, of the 700 block of S. Kostner Avenue. ROGERS PARK — Offended by the music pumping from a passing car's radio, a man at a roadside memorial for a slain gang member pulled out a gun and shot up the car, wounding two innocent people. The two victims just happened to be driving by the memorial on the Far North Side — with their windows down. The shooter didn't like the music, walked up the car and started shooting, police said. The shooter was apparently "offended" by the song — and "boom, boom, boom," police Officer Robert Dworak said Tuesday night at a community policing meeting. Dworak didn't identify the offending tune, but did tell residents the innocent victims — a 24-year-old man and 31-year-old woman — survived and are in good condition. It happened on Sept. 11. The shooter was standing on a corner near the 1600 block of West Juneway, a site of contention in the community, when the driver pulled up with the car windows partially down playing music. The wounded man and woman were able to drive away to a nearby gas station on Sheridan Road where they called police, who met them and inspected the vehicle for evidence, Dworak said. A man was later arrested and charged with two counts of aggravated discharge of a firearm, he said. 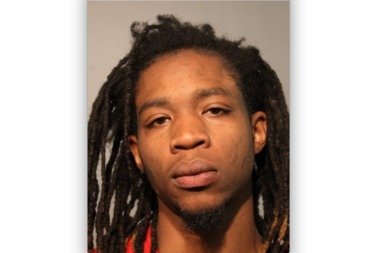 Police said the alleged shooter, Nathaniel Richardson of the 700 block of S. Kostner Ave., had been involved in a gun-related incident about two weeks earlier in the area but charges were dropped after prosecutors said there wasn't enough evidence for a conviction. The memorial for Glenford Johnson, a high-ranking 19-year-old gang member who was gunned down on the same block last year, was purely coincidental in terms of any connection between the victims and shooter, Dworak said. "These were totally innocent people unrelated to any gang activity," the officer said. Dworak said they were aware people were going to be gathering to honor Johnson throughout the day and had tactical units monitoring the block closely, he said. But they found no evidence a memorial was taking place until his shift ended around 3 p.m. — noting no candles or other typical markers of vigils were on display during the day. Once night rolled around, however, those memorial symbols were displayed on the sidewalk and people began to gather outside in larger groups.